Yeah, Ileney, that's also one reason opal photos "in hand" can be a big help. If the white balance isn't right, or if the color and intensity have been altered in the image the skin tones will begin to look different too. I use an artificial led for photography, set at about 4500 k for a daylight. I also set the digital camera for that light temperature and post process from raw at that temp as well. I expose for the stone and when selecting the stone photos (joy of working in raw) adjust the exposure of the photo with the stone by my side so the colour of the photo is as good a representation of the actual stone as I can get. Quite often, the intensity of the colour flashes just don’t come out in photos or video but I’d it be that way than having something that burns your retinas out on the screen! 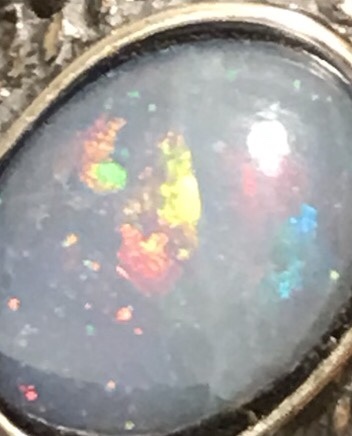 Also, a photo enlarged even where you have got it really accurately showing the stone, when compared to a small stone in your hand can look spectacular. I’ve found the Nikon digital camera I use dulls down the reds quite a bit and really shows the blues. There’s one dark grey lightning ridge opal I have, not much colour play but some flashes of blue, when I photographed the stone I had to really tone down the blues to what my ey3s were actually seeing. I’m going to try a more neutral background though...photographing opals is quite difficult! I do usually have one of my photos with a scale present...that is neutral and helps tells me if I have colour casts present that I need to deal with as well. I also video them as well...loads more problems! Try a polarize lens in sunlight. Though if you have a 27 degree adjustable polarize lens ( This is a double lens ) you can then adjust the spectrum to the colors of the stone in sun light. I use mineral oil coating on fire agate rough, stays wet for days and a great refractive photo of material.